The pencils only rule at the British Library means I have become closely acquainted with the ancient art of pencil sharpening. Having tried many different types over the years and found them all wanting, I finally splashed out on a Kutsuwa RS015BK. The previous designs were either too blunt or too flimsy to produce a properly sharp nib. Or they broke off the end of the pencil lead just as it was on the point of being ready to use. Kutsuwa Co., Ltd. was founded in 1910 as a stationery wholesaler in Osaka, Japan. In 1965, they started to design and manufacturer its own branded products. The model I chose came in a range of vibrant colours as one might expect from a Japanese manufacturer, but I went for the boring black model. It is still early days, but so far I am very happy with the way this machine produces wonderfully sharp pencils, easily and quickly, as well as collecting the messy cuttings in a waste box. So the lesson learnt here, once again, is if you want a good pencil sharpener you need to pay that bit extra. Perhaps I should have researched this topic more thoroughly before spending my money. 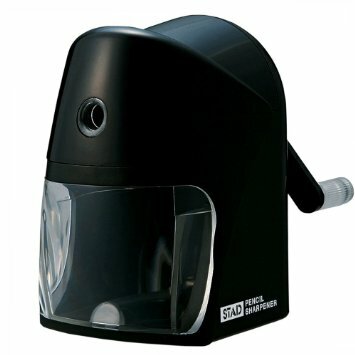 The Pencil Revolution contains many reviews of sharpeners. 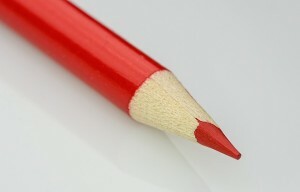 Or I could have read The art of sharpening pencils on Mathew James Taylor’s blog. Where I would learnt about the standard point, the chisel point, the needle point, or the bullet point. Although I definitely wouldn’t have chosen his favourite rather disturbing sharpener below. 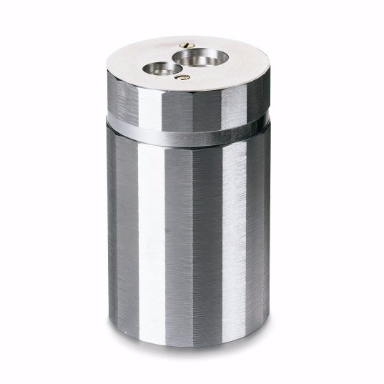 I shouldn’t have been surprised to discover the ultimate sharpeners on the Manufactum website, as they specialise in goods made with traditional manufacturing methods and materials. 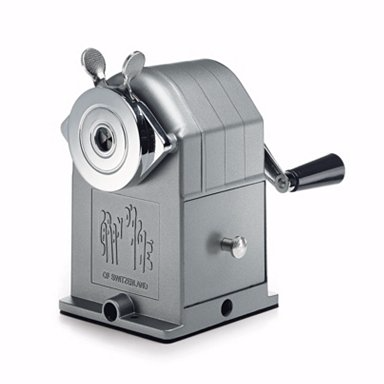 They include the beautifully simple Dux Dual Pencil Sharpener Aluminium and the outrageously expensive but indestructible Caran d’Ache Steel Pencil Sharpening Machine. This entry was posted in branding, technology, usability, work/life and tagged pencil sharpeners, pencils on 21 February 2016 by ninfield.